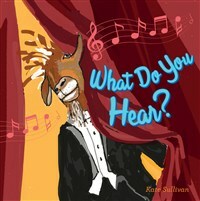 A young person's tour of a symphony orchestra, this book introduces ten quirky animal musicians rehearsing for a concert. The players include an eccentric hippo flautist, a farmer-dog double bassist, a prim poodle French horn player, and a hip giraffe oboist, with a self-assured billy-goat as the conductor. Children will have fun learning about the instruments in an orchestra and the distinctive sounds they make.